Untold Origins | 2P START! I absolutely love the way this comic turned out. Sometimes I’ll have an idea of what the comic should look like in my head and Ray will get it just right. This is one of those times where he far exceeded what I had imagined. I think the extra week off for Ray was well worth it! Also, the idea for this comic actually came to me while Ray was out here visiting (in California). I’m not sure what brought the idea on, I just remember that I was doing dishes when I proposed the idea to Ray. The idea was originally just “What if Goombas and Koopa Troopas were actually Pokemon?”, and I later fleshed it out into an real story. Enjoy! With last week off, I knew people would expect a great looking comic when I returned. So I knew this had to be good. Thankfully, I think it turned out to be just that. I had a lot of fun putting this strip together, and thanks to Tim’s excellent idea, it really gave me the drive to make it look great. Hope you guys enjoyed it! Great comic! One of your best yet. And really well drawn too. It was definitely worth the week off! HAHAHA! One of the best yet! I love your comics. The only downer, was when you had the guest comic. But, considering the fact that Mario came before Pokémon, wouldn’t that technically mean that Goombas and Koopas are actually the fathers of nearly every Pokémon? Now that’s something to chew on! ookkkkaayyy……. that was kinda weird…..
no, wait. that was really weird. where do these ideas COME from?!?! Another oddity… if that’s true… then how are their PARENTS pokemon? and also, theres turtwig in there. thats a fourth generation pokemon (from diamond and pearl). so thats where things get really wonky. yeah…I wasn’t going to take the genealogy of Pokemon that deep, but the creation of Mario Bros. and Pokemon doesn’t necessarily indicate which came first, right? The Star Wars trilogies show that to be true. So, let’s assume the world of Pokemon already exists when the world of Mario comes about, then Goomba and Koopa could really be 5th generation Pokemon, right? Oh my god its true. I would never have suspected it. One detail no one pointed out was the human anatomy poster on the wall. I love the Dr. Mario bottle reference. remineds me of a comic i saw somewhere (i forgot where but i dont think it was 2p start, maybe vgcats or something? 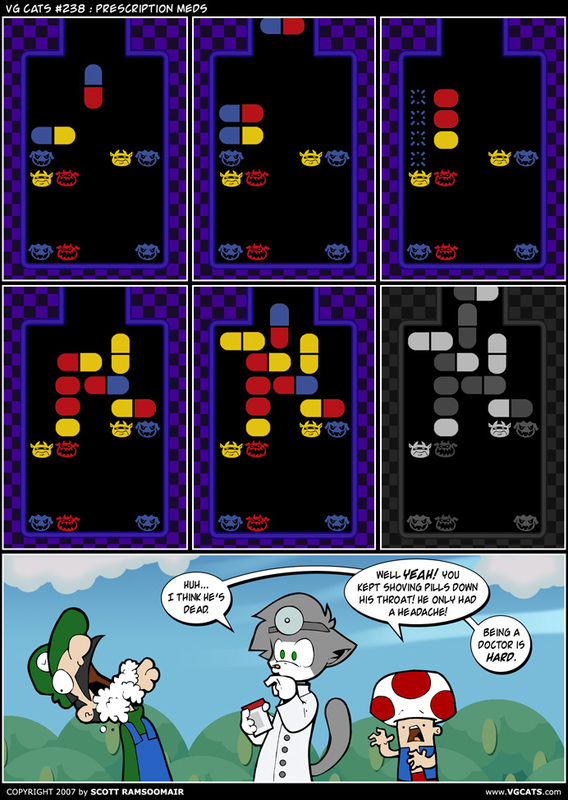 ), where there were all these doctor mario pills going down, and they reaced the top. then you see luiigi, foaming at the mouth. and a toad is like, “he only had a headache! why did you keep shoving pills down his mouth?” and the response from ‘doctor mario’ is “hey, being a doctor is hard work!” funny. ill submit a link if i can…. no!!!!! must not sumbit links to other webcomics! how could i even think it…………..
another strange thing i noticed. and that strang thing is that i am commenting way too much. so i should shut up for now. Tristan, don’t worry about other webcomic links, it’s pretty unlikely that we’re going to lose 2P START! fans to VG Cats, seeing as VG Cats already rules the world. I had seen that comic and now I start to wonder if that reference was a subconscious tribute to the VG Cats comic…hmm…yeah, probably was! Wonderful! I definitely loved the “support our troopas” poster. And the idea of Pokeman parents. Great comic, guys! FANTASTIC! Kinda makes me want to pick up my copy of Pearl again. I need a Support our Troopas t-shirt, now. Funny thing is… Both of those pairs are compatible for breeding. i noticed another screw-up. if those were their parents, they would be the same pokemon as their mother was, you know? so why would they look so different? Pokemon Breeding rules/changes for Generation V Pokemon have not yet been revealed. But it’s possible that those combinations would result in Koopa and Goomba. See here. this is unrelated, but what do you guys think of my new mario icon? Looks just like Mario. That’s tight! As if I needed another reminder of Smash Bros. Brawl……. kept me laughing for a while should i go to play pokemon again i lost interest after stadium. i should get back to check this webcomic every now and then stumbled across it. whoops. sorry about that! heh! btw, i think galaxy comes out around about… tomorrow i think? =D i cant wait! woah. the quoting on that last thing failed! everytihing up the the dots should havbe been in quotes. ah well my computer hates me today. even i have to wait for the text to appear even as i type this! Another awesome comic! This is your best yet! Seriously, you need to make that Support our Troopas into a sticker or something. I’d definite put that patch on my backpack, and I’m currently in Iraq. Hey, I just realized I could get them to make one! btw, what i am about to say has almost no relevance to the comic here (though it is mario related, and i will make some people happy to learn). SUPER MARIO GALAXY IS COMING OUT TODAY!!!!! lol!! I wanna be a pokemon! I’m glad I’m not the ONLY one who noticed that both of those pairs of Pokemon can breed…. allow me to once again add the the comments of this one. I think this was the first one i ever commented on…. This comic would have been far better without the text in the last panel. That is what I think of my old comments. There are no smilies good enough to describe the WIN in this comic. Wow, I was going through old comics and I just noticed that the last speech bubble is two different colors since both of them are saying it…nice touch! Well, it’s all Nintendo, so don’t be surprised. YOUR GOOMBA IS EVOLVING! CONGRATULATIONS! YOUR GOOMBA EVOLVED INTO KURIBO! YOUR KURIBO IS EVOLVING! CONGRATULATIONS! YOUR KURIBO EVOLVED INTO PARAKURIBO! YOUR KOOPA IS EVOLVING! CONGRATULATIONS! YOUR KOOPA EVOLVED INTO PARAKOOPA! YOUR PARAKOOPA IS EVOLVING! CONGRATULATIONS! YOUR PARAKOOPA EVOLVED INTO LAKITU! And yes, I know that Kuribo is just what Goombas are called in Japan. I once omegle’d a guy from japan. He said they didn’t have much weed but a bunch of acid and shrooms there. Our inventions are toilet paper arm extenders. They invent awesome.